What is new with RxDx? See who just joined our outstanding team of medical specialists and super specialists and get to know them. Learn about our new services and newly acquired facilities to serve you better. Meet Pediatric Cardiologist-turned-pioneering healthcare entrepreneur Sunita Maheshwari. We talk to her about medicine, technology and most importantly parenting. Taking healthcare to remote corners of the world is her dream. Sunita provides teleradiology services through her company to hospitals around the world, especially in under-developed countries, where radiologists are not available around the clock. The Inauguration of ‘RxDx eAarogya Centre’ was held in Hoskote 29th November 2018. AkzoNobel director Guha Rajasekar spoke on this occasion and stressed on improving the health status of the rural communities. Speaking on the occasion Telerad Foundation and RxDx Clinic Founder, Dr. Sunita Maheshwari explained that since 2007 RxDx is giving to its patients affordable and quality services and now with the partnership with AkzoNobel it aims at providing low-cost services to the rural community. Among those present on the occasion were AkzoNobel CSR head Parthasarathy, Mr.Ashwani Sinha, Global Business Head, Telerad Tech. Local School Principal Mahesh, Gram Panchayati ex-member Byregowda were present at the occasion. This news article was covered in the Kannada daily ‘Samyuktha Karnataka’. Several Newspapers including Andhra Jyothy, Samyukta Karnataka, Sakshi -Telugu Daily, Eenadu and Sanjevani covered this event in their columns. Meet paediatric cardiologist-turned-pioneering healthcare entrepreneur Sunita Maheswari. We talk to her about medicine, technology and most importantly parenting …. In our new series Leadership From Failure, we highlight what entrepreneurs and leaders have learned from their mistakes and how they have used failure as a stepping stone to become leaders and role models. 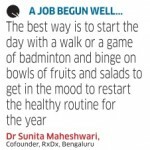 Today, we have Dr Sunita Maheshwari, Chief Dreamer and Loop Closer, Co-founder of Teleradiology Solutions, RXDX Clinics and Telerad Tech…. POLYCLINIC TREATS YOU, AND GARBAGE This eco-friendly facility has a biogas plant, and a plan to use it well There is a polyclinic in the city where you can walk in, dump your food waste and when things work out, maybe even fill in your gas cylinders with biogas. Drs @ Art – A group show of Paintings by Doctors inaugurated by Dr Sunita Maheshwari on 18th Feb 2017. The Head That Won’t Stand is a story of one month that author Kavita Chandran, a Singapore based business journalist spent reflecting, rediscovering and rekindling her spirit – and yes, learning yoga too.The book encapsulates her journey from day one to the end of a four-week intense training course at Mysore under yoga guru Bharath Shetty – but very early in the book, it becomes clear that this is not just a quintessential yoga journal, or a memoir, but has in fact, a much wider canvas. NABH Accreditation for Telerad RxDx – Whitefield. Sunita Maheshwari, a Bangalore-based pediatric cardiologist and founder of RxDx, which uses Healthpresence to connect with patients in the low-income district of Raichur in northern Karnataka, said Cisco’s product works very well in telemedicine. We were skeptical at first, wondering will rural India’s villages accept such technology. But they’re really thrilled because they have a doctor out there for the first time, the Indian American Maheshwari, who was trained at Yale, told India-West.